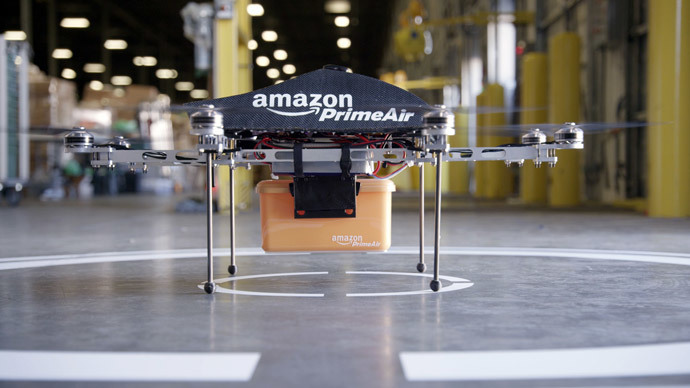 Federal authorities have finally agreed to allow Amazon to test delivery drones in the US. The e-tail giant hopes to revolutionize local delivery services, but restrictions on drone use, mean it could be a while before it becomes commercially viable. Citing the need to “ensure the next evolution in package delivery happens in the United States first," the Federal Aviation Administration (FAA) notified Amazon on Thursday that it would be allowed to test unmanned aerial vehicles (UAV) over the next two years, under certain conditions. According to the FAA’s letter, the drones shall not exceed speeds of 100 mph, (160kph), fly above 400 feet (122 meters), or weigh more than 55 pounds (25 kilograms). This will include their payload, while they are also not allowed to leave the operator’s line of sight. This final provision may prove to be the biggest challenge to deploying the UAVs commercially. How the hell is Amazon going to get any mileage out of drone delivery, if FAA says the drones must always stay in line of sight of pilot? Last month, when the FAA approved Amazon’s initial request to test drone deliveries, the company said federal regulators had taken so long to reply the technology named in the application was already obsolete. Instead, Amazon has been testing its UAVs in British Columbia, just north of the US border, having obtained permission from Canada earlier this year. The company is hoping to use eight-rotor drones in a program dubbed “Prime Air,” envisioning same-day delivery of packages under five pounds (2.2 kilograms) to customers within a 10-mile (16-kilometer) radius of an Amazon warehouse. According to a 2014 study by the New York-based financial research company ARK Invest, the cost of such deliveries could be as little as one dollar. The report also suggests deliveries might arrive in as little as 30 minutes. Basing the study on the existing technology and prices, ARK estimated it would cost Amazon $100 million to buy the drones and another $300 million to use them for delivering 400 million orders annually. Currently, Amazon charges $7.99 for one-hour delivery of certain products in several cities, including Baltimore, Dallas, Miami and New York. That program, launched in December 2014, is called Prime Now. Earlier this week, the FAA also approved the use of UAVs by three insurance giants – AIG, State Farm and USAA – indicating that widespread commercial use of drones could be just around the corner, if and when the FAA drops the requirement that the vehicles remain within the operator’s line of sight. Some reports have suggested that drones be outfitted with cameras or radar, so that operators can stay in control even when the UAVs go out of sight, but there is no word on whether the FAA sees this as a viable solution.